– Loose is fast: a looser chain is always the best for performance, but the tradeoff is that if it chain is too loose, it will fall off the chainring or cog (more likely chainring). The bumpier the track, the tighter you have to run the chain in order to prevent this from happening. The velodrome I ride at and teach at most frequently, Boulder Valley Velodrome, is very smooth so you can go looser than on many other tracks. – Chain tension: chain tension is determined by the position of the rear wheel in the dropouts, the roundness of the ring and cog, and the condition of the chain. Chains can have loose and tight spots, so you have to check the chain tension over the entire length of the chain. Don’t assume that because the chain tension is optimal in one position, it will be over the whole thing. – Chain type: chain type will impact how loose you can run it. The width of drivetrain components, also known as pitch and lateral flexibility will in part determine how tight you have to keep the chain in order to keep it from coming off. Tradition “track” width is 1/8″, while “road” width is 3/32″. NOTE: chainring, cog and chain widths should not be mixed. While you can put a 3/32″ cog on a wheel and use a 1/8″ chain with it, this combination makes it far easier to throw the chain off the cog. If you try and put a 3/32″ chain on a 1/8″ cog, it will not engage the teeth (the cog will be too wide). Your drivetrain components should be on consistent pitch throughout; avoid mixing and matching. The more laterally flexible a chain is, the more likely it is to come off. Modern road drivetrains are made with chains with a high degree of lateral flexibility, this is what makes a chain shift very quickly and quietly from one cog to another. 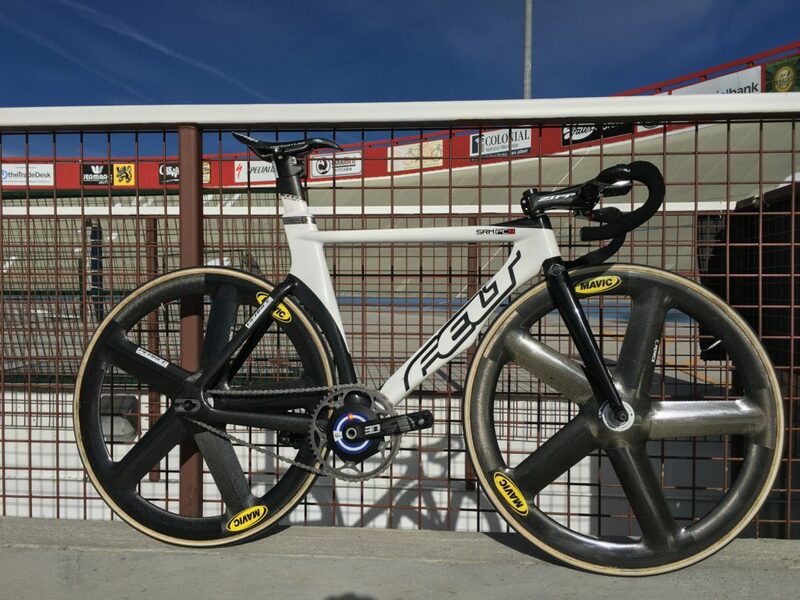 The first choice for any track bike should always be a chain that is track specific or made for a single speed / BMX bike. Any 9/10/11 speed road chain is not made for track use and will require more tension to stay on the chainring relative to a single speed or track specific chain. Road chains can be used on the track but they are definitely not optimal. DANGER: fingers get caught in track drivetrains all the time!!! Nearly every veteran trackie has war wounds from an incident involving a chain. Always be careful when checking chain tension and don’t allow yourself to get distracted. Also don’t wear loose sleeves or other dangly fabrics that could get caught in the chain while checking tension. If you develop a consistent technique to checking your chain tension, it will reduce the likelihood of an accident. 1. Stand behind the bike and lift the saddle to be supported by your left shoulder. 2. Hold the rear triangle of the bike with your left hand, either on the chainstay or seatstay, lifting the rear wheel off the ground. 3. Spin the drivetrain by pushing on the right pedal with your right hand. 4. In the middle of the chain (the spot between the chainring and the rear cog, push on the side plates of the chain with your right index and ring fingers, as the chain moves towards the chainring. CAUTION: don’t let your fingers follow the moving chain all the way to the chainring. Stop and replace your fingers on the side plates half way between the ring and the cog before you get to the ring. You will repeat this process 4-5 times to cover an entire revolution of the chain and get a feel for the tension in different spots. There should be some lateral movement to the chain. If the chain barely moves and has no feeling of “play” it is too tight. If the chainring starts to come off the chainring (with a “popping” noise) or comes off the ring, it is too loose. Make sure and go through the entire revolution of one full chain to check the tension all the way around. If there are loose or tight spots, adjust accordingly (see below). 5. If there is a big difference in the chain tension in one revolution, consider re-tensioning your chainring bolts. Always tension chainring bolts in a “star” pattern, never in a “clock” pattern. Tightening in a clock pattern can result in “winding the ring up” which will rotate or twist it subtly under the tension of the bolts, and this can result in uneven chain tension in the drivetrain. 6. If your ring or cog are really out of round or bent, replace them. If your chain is toast, get a new one. Side note: track chains do need lubrication, contrary to urban myth. 7. Make sure the axle nuts are tight when you get the chain tension dialed. It is *almost* impossible to over tighten rear track nuts on a well made track hub. Some riders or coaches have alternate suggestions for checking chain tension. Some suggest using a wrench to check lateral tension, but I feel it is very difficult to get an accurate read using this method. Plus, a metal wrench on a metal chain is slippery, and if the wrench slips off a moving chain, it goes into your spokes, which may bend a spoke or chip the carbon on a fast wheel. This is why I recommend using fingers. With practice, this method is very safe. Some riders also suggest spinning the drivetrain quickly and checking to see if the chain will fall off by picking up the bike with the moving wheel and shaking it violently while holding it sideways. In my opinion, this is an inelegant solution that is begging for an accident. It takes up a lot of room on the infield, where a lot of athletes and people are coming and going. It involves picking up a bike with the wheels and drivetrain moving at high speed. The rider may also be mistaken for someone flagging overhead aircraft for emergency assistance. These are simply my suggestions on the best way to check chain tension. Use whatever method works for you, the important thing is that your method is safe and effective. 1. With axle nuts loose, slide the wheel back until the chain is lightly tensioned and the wheel is centered. 2. Finger tighten each axle nut. 3. Tighten left axle nut with wrench until it is just tight (not fully torqued). 4. Tighten right axle nut with wrench until it is just tight (not fully torqued). 5. Check chain tension and wheel center relative to BB and seat stays. Note: some frames with lesser tolerances will allow the wheel to be centered in one aspect but not the other, at the same time. This means the wheel is out of plane with the bike (sad face). Solution: get a new bike, or align the dropouts (if the bike is steel and they can be aligned). 6. If the tension is too tight or loose, first loosen right axle nut, then grasp the rim at the chainstay, near the bottom bracket, with the left hand (standing behind the bike) and move the rim back and forth (to non drive side to decrease chain tension, or to drive side to increase chain tension) in tiny increments. Re-tighten right axle nut. 6. Check wheel alignment, if necessary, loosen left axle nut to center wheel. This may impact chain tension. 7. Check chain tension. If it is too loose or too tight, return to step 5. Note: if your dropouts are not made correctly, or if the material is worn or grooved, the axle will have a tendency to fall into old areas of wear, making chain tension optimization difficult. Solutions include filling dropouts smooth, replacing dropouts or dropout slots (if possible) or getting a new bike.